It has always been a given that when it comes to things that matter, rules should be applied in order to have a semblance of order about you. The same sentiment is employed as regards things that people are passionate about, but is not that an irony in itself? When you have a burgeoning passion for something such as art or writing, should it not be approached with total and wanton abandon? Would it not be a little more meaningful if it were unrestrained and in effect would it not feel a little more liberating? Aspects and worldly things such as art and fashion should not be inhibited and encumbered by rules and rigid rubrics—but, here we are. In these contemporary times where revolutionary leaps and advancements were made not only to technology, but to fashion as well, fashion forward people should not feel restricted to the rules proclaimed by so-called style pundits and fashion icons. Today, modern fashion has dictated that style should not only be unique and individualistic but unrepressed and free as well. In this regard, people should endeavor not to pay meticulous care about the past fashion edicts that were issued and should focus more on what they deem to look good on them. Today, contemporary fashion caters to just about everyone and with wholesale clothing offer a wide variety of sartorial options, nobody would be left out. In this regard, creating, finding and developing your personal style would not only be possible, but heavily encouraged. 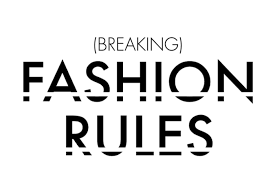 So, if you have ever found yourself bound to the same set of fashion rules or are still likely obsessing over style proclamations that are hardly relevant or are even obsolete today, take a gander at the list below. In this regard, you would not only be able to develop a few fashion rules for your own, but reevaluate and reassess your sartorial options and choices as well. While no one is likely going to tell you to ditch your pajamas and swimwear in favor of one set and style of clothes, no one would tell you to have a complete nighttime ensemble either. Back in the day, it used to be that people would wear pajama sets that included silk robes and even slippers. Some of them would even go as far as to embellishing the entire ensemble with sparkly statement jewelry, but today that is hardly the trend. In fact, today’s fashion would even see what you would normally consider as bedroom wear as things you would wear to the nightclub or even to the grocery store. Contemporary style has made unconventionality the height of fashion. The time for wardrobes segmented into strict categories such as “dressy and casual” is in the past. Today, anything goes. What is important is that what you are wearing does not only look good, but feel good to you as well. It was precisely this statement that caused a global debate in the fashion world. It seems that some people just could not wrap their head around the concept of wearing leggings (a ubiquitous fashion staple for women) and sweatpants as a pair of jeans. However, today, with more and more women favoring them not only for their elasticity and ease of convenience in wearing, it seems rather backward to not consider them as pants. Do yourself a favor and ditch the idea that leggings can never pass off as pants, you will live happier that way. Not only are these sartorial staples easy to wash, but they do not take up too much space in your closets as well. With all those attributes on a single sartorial item, is it really any wonder why women would hoard them? Articles about style and online fashion blogs have all decreed the importance of a single statement bag to a woman—an investment piece that would likely cost her at least three months’ worth of her salary. In fact, as most of these investment and statement bags are priced at a premium, majority of women folk would not be able to afford even just one straight out. In this regard, these style sites have taken it upon themselves to offer articles detailing their advice on how to save for one. If owning a statement Louis Vuitton has always been your dream, then go ahead and take the plunge. But do know that in today’s fashion times, there is quite a myriad of brands who are producing high-quality bags that can be heirlooms. The best part about these bags is that you would not have to starve yourself in order to afford one—it would not even require you to adjust your standard of living and lifestyle. In essence, owning one of these (or even two) is a lot more practical than going for a bag you literally have to toil over just to afford. Whoever said this rule should be publicly flogged. Saying older women should not follow trends is like saying they are not allowed to have their own personal style—which goes against what fashion stands for. Being trendy is not exclusively for the young. Although the conventional wisdom holds that women should dress more like their age and should be a bit more conservative over time, know that this does not apply to contemporary style and modern fashion. Just think of the consequences you would face should you follow this advice. By abstaining from trends by the time you are sixty, you are effectively relegating yourself to matronly wear such as black slacks and twinsets. Not a very good choice, is it not? Yes, it is age appropriate but it is not exactly as fun. It does not matter what age you are, be unapologetic about your love for fashion and wear things you do love and look great in. Over the past years, women have always stood by the advice that your pants should be perfectly tailored to fit your body. However, the last few years has seen a refreshing twist and change to do that. With the rise of the mom and boyfriend jeans, it seems that the iconic pair of awkward pants has become the new trendy thing to wear. Ripped and frayed hems have joined the bandwagon as well and women cannot help but try on these different styles. Back then, pants should be well-tailored that when the fashion industry first introduced the elephant-leg pant, everyone scoffed at it. Today however, wide-legged cropped jeans and their well-known and loved cousins such as culottes and the like make for a perfectly acceptable silhouette. So, break free from the street safe pants and look for ones that are a little bit oversized and at times so overly long. Sure, they may have enough fabric to actually conceal your shoes and drag on the ground, but they make for an excellent fashion statement. They may not be always right, but you cannot deny that they are not only elegant, but sophisticated as well. A pair of heels is great and there is no denying that every woman needs at least one as well. However, while they can make your calves look toned in just minutes, they are also a pain to wear. Just imagine yourself in them for a full night at the club and you can already imagine the pain you are submitting your feet to. Fashion does not have to feel like you are punishing yourself as it can be both beautiful and comfortable. So, if you feel yourself gravitating to a pair of sneakers or fancy flats, there is no reason to wear a pair of pinching stilettos just because you want to look fancy. By all means, wear a pair of sneakers as not only is this considered a rising new trend, you would be making waves and be considered a refreshing trendsetter—a revolutionary fashionista worth emulating. This belief could not be any more irrelevant than in today’s contemporary fashion time where there has been a rising trend in androgynous looks. Women are no longer constrained to feminine styles and men can now even be seen sporting bags—elegantly so. So, do not confine yourself to gender-specific styles and try to break ground with sartorial styles you have always wanted to try—even if they are not incredibly feminine. While style has been mostly considered a hit or miss thing, know that you should not restrict yourself to a certain set of rules imposed by people who thought they knew better. Remember, modern fashion is all about finding your style, creating it and developing it and to do that, you must take a look past these rules. Not only would this be completely liberating, but you would feel a lot more in tune to your style as well.